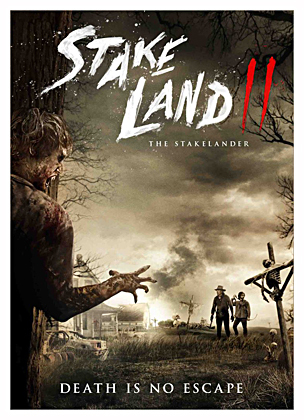 Sequel to the Jim Mickle’s 2010 vampire epic, Stake Land, takes place ten years later with Martin (a returning Connor Paolo) living in New Eden with Peggy (again Bonnie Dennison) and raising a young daughter. One night, The Brotherhood lays siege to this sanctuary lead by The Mother (Kristina Hughes), a vampire who commands an army of Berzerkers. The village is massacred with Peggy and their daughter brutally killed. Now the surviving Martin returns to the desolate wasteland of the United States to find Mister (Nick Damici reprising his role) to exact revenge…and that’s exactly what Mother is counting on. Jim Mickle sits this sequel out for the most part, appearing only as a producer. His star and co-writer on the original, Nick Damici, returns to script and the directorial reigns are turned over to Dan Berk and Robert Olsen…sadly with mixed results. Damici’s story works fairly well in reuniting Mister and Martin with some interesting developments having transpired between films. With the human population devastated, the vampires have grown desperate for food and will now risk coming out in the sunlight to pursue a meal, even if it means burning up. Some of the humans have turned to barbarity and resort to cannibalism and staging gladiatorial battles between strangers…which is where Martin finds Mister. The character of Mother is also interesting, though a bit underused as Damici’s story focuses on Martin and Mister and the groups of humanity they encounter. We do find out a little about Mister’s background, a past he shares with Mother. On the downside, Berk and Olsen are a bit pedestrian in their direction and thus it lacks the first film’s intensity and atmosphere. The action and drama are all a bit by-the-numbers and this doesn’t help as the film needs a fresh touch, being the second time around for what was a different take on the traditional vampire tale in the original. It comes across as more of a TV movie which, having premiered on SYFY, it kinda is…and it shows. At least the cast all do well, especially the returnees. Paolo gives us a far more mature and able Martin, now more of a grizzled warrior than the naive boy we met in the first installment. Damici is solid once again as Mister. He gives the vampire hunter a bit more inner pain accumulated over the last decade and the fact the character is sidelined with injury for part of the flick is disappointing, as it’s great to see him back. Damici reminds one of Charles Bronson, at times, with the grizzled tough guy roles he often plays. Hughes is creepy as Mother. She has a presence and it’s unfortunate she’s a bit underdeveloped. Rounding out is Laura Abramsen, who is fine as Mister’s mute, feral woman companion and A.C. Peterson and veteran actor Steven Williams are entertaining as two leaders of an armed outpost who join Mister in standing against Mother. Sadly Bonnie Dennison’s part is far too short to really count as more than a cameo. Overall this is an OK sequel to, in my opinion, one of the best horror films of 2010. The returning characters were fun to see again and were well played by the returning stars. Actor/writer Nick Damici had a worthy enough story and some interesting developments, but the film lacked Jim Mickle’s touch behind the camera. The direction was by-the-numbers and while entertaining, the film lacked the intensity and atmosphere of it’s predecessor and appeared to be working with a smaller scale and budget. Worth a watch if you are a fan of the original film, but if you haven’t seen Stake Land, seek that out first. Mulberry Street is the first feature film collaboration from the Stake Land writing team of director Jim Mickle and Nick Damici, who also plays the lead role of ex-boxer ‘Clutch’ (and Stake Land’s ‘Mister’). Mulberry Street is a horror flick that takes place in a NYC tenement on the eve of it’s tenants losing their homes to eminent domain. As Clutch receives a visit from his soldier daughter (Kim Blair), returning from service in Iraq, a bizarre outbreak hits the neighborhood and Clutch, his daughter and their neighbors, become trapped in their apartments as people around them are being transformed into vicious killers with rat-like features. Can they survive the night as this bizarre outbreak spreads through the apartment building and the rest of the city as well? The story might sound silly to some but, Mickle takes his tale of a zombie outbreak with a vermin twist completely serious and makes one creepy and effective horror flick out of it. Mickle maintains an atmosphere of dread throughout and offers some tense and suspenseful scenes as our apartment dwellers become the target of their vicious and hungry former neighbors. The almost documentary like style draws us in and Mickle gives us some very ‘real people’ characters to care about and root for. He gets good performances out of his cast and presents some simple but, very effective FX to portray his protagonists and their carnage. 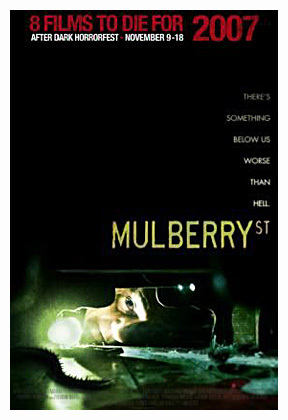 Mulberry Street may not appeal to the casual or mainstream horror fan but, to those who enjoy something offbeat, inventive and a little different, then a trip down Mulberry St. is a creepy trip worth taking and a very effective little horror on a micro budget. Obviously, I like this movie a lot and it shows the potential Jim Mickle has lived up to with his following films Stake Land, We Are What We Are and Cold In July. It’s a fun and very creepy twist on the standard zombie format and uses what could have been a silly premise very effectively. It’s spooky, atmospheric and accomplishes a lot on a very small budget. Definitely recommended to those who love some variety and originality in their horror. As a big fan of writer/director Jim Mickle (Stake Land/We Are What We Are 2013) I was eagerly awaiting his next flick especially when I heard it would be a thriller and star Dexter’s Michael C. Hall. And while I feel the film left a few questions unanswered, I did like it’s bold changes of direction and Mickle’s very John Carpenter-ish style… including a dead-on Carpenter-esque score by Jeff Grace and a character named ‘Jack Crow’ (Lanny Flaherty) as from Carpenter’s Vampires. And I can only believe it was all deliberate. The film is based on a book by Joe R. Lansdale and takes place in 1989 Texas. Small-town picture-framer Richard Dane (Michael C. Hall) wakes up in the middle of the night to find an intruder in his house. In fear for the lives of his son, wife and self, he reluctantly confronts the man with his gun and shoots him dead after being startled. The unarmed man is identified by police chief Ray Price (Nick Damici, who co-scripted) as Freddy Russell (Wyatt Russell) a wanted man and known felon. Richard is stricken by guilt but, that is the least of his troubles as Freddy’s dad Ben (Sam Shepard), also a felon, has just been paroled and begins stalking Richard’s family, with apparent harmful intent for his little boy. But, as the police pursue the revenge minded Ben, the situation takes a bizarre turn as a twist of fate leads Richard to believe the man he shot was not Freddy Russell. Now to uncover the mystery of who was actually killed in his house and why the police are lying, leads Richard to the one person least likely to want to help him… Ben Russell. Michael C. Hall is very effective as a demure small-town business and family man who is dropped into a violent situation that turns into a mystery and gets even more violent. He seems like a good man who truly wants answers to satisfy his conscience for not only killing an unarmed intruder but, why he was lied to about his identity. I’m not sure Richard would have pursued things to it’s bloody end when given a chance to walk away, but, Hall is still good in the part, nonetheless. Sam Shepard is absolutely gripping as Ben Russell. At first he comes across as a violent and vengeful man with harmful intent toward Dane and his family but, as the mystery unfolds, he becomes a different person altogether and one who might actually have a sense of honor underneath the convicted felon. Shepard is a gifted actor that really makes a simple criminal into a complex three dimensional character. Don Johnson also shines as good-ole-boy private detective and pig farmer Jim Bob Luke. He has a good time with a man who is both charmingly Americana yet, larger than life and Johnson also imbues a stereotype character with some layers and dimensionality as we get to know him. Johnson’s last few roles has shown us an actor who has matured gracefully and only gotten better with age. Nick Damici also proves he has become a good actor aside from Mickle’s co-writer, on all his previous projects, and his Ray Price is an interesting character with interesting motives and it’s too bad the story leaves him behind at a fairly early point. The rest of the supporting cast are just fine and the acting helps make this flick work as well as it does. So, despite a few unanswered questions and some changes in story direction that may throw some viewers off… but, I liked them… this is a taunt and sometimes very violent thriller from a director who continues to grow and surprise. I loved tha the film evoked John Carpenter in his prime and what it might have been like had the master director done a down and dirty thriller like this. I also loved Jeff Grace’s very Carpenter-ish score and the addition of a character named ‘Jack Crow’ leads me to believe that the Carpenter style and score was not a co-incidence. An atmospheric thriller not afraid to change gears and take us in unexpected and sometimes blood-soaked directions, guided by a director who can deliver the goods and win us over despite the film’s flaws. 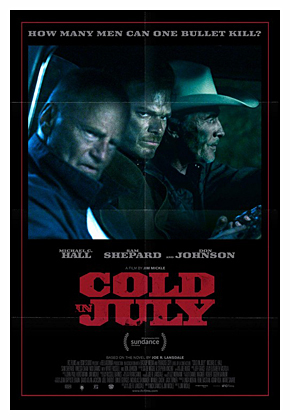 TRAILER HITS FOR JIM MICKLE’S ‘COLD IN JULY’ WITH MICHAEL C. HALL! We Are What We Are is Jim Mickle’s (Stake Land, Mulberry Street) remake of the 2010 Mexican horror of the same name by Jorge Michel Grau. And while I am not a fan of the original film… I found the premise intriguing but, the film boring and the characters very uninteresting… I am a fan of Jim Mickle so, I was curious to see what he did with Grau’s story. And having finally caught up with this film, I can honestly say I really like Mickle’s version much better. He has taken the basic story and made his own movie. And since this is the type of story that is best enjoyed knowing as little as possible going in, my plot description will be brief. The film takes place in a small rural town where not only a massive storm and flood hits but, the Parker family tragically loses their matriarch. The family is in an obvious emotional tailspin over her death but, things are about to get worse. For the Parkers are a family with a dark secret that has been hidden for generations but, this dark secret may soon be brought into the light as receding flood waters may bring things to the surface that the Parkers would like to have remained hidden. Mickle once again scripts with writer/actor Nick Damici who also appears as Sheriff Meeks. Where I felt that Grau’s film concentrated more on the drama between thinly written family members, Mickle center’s his film on the more interesting part, which is the the dark secret that the Parkers are harboring and the slow burn as it appears it’s about to unravel. The family elements are addressed here and Mickle does give us more interesting characters but, the film concentrates more on the act of fate that begins to bring unwanted attention to the family and the gruesome possibility that their home is a house of horrors and one about to be discovered. Something this recently wounded family is not ready to deal with. This gives Mickle’s version a slow building tension the other film lacked and Mickle is very good at building that subtle tension and giving the film a pervading atmosphere that something is not quite right. He accents this with his distinct visual style which is refreshingly subtle when compared to a lot of today’s editing FX happy filmmakers. The film is not about big scares and gory horror… though there are moments when the film gets gruesome but, most of all it’s about keeping the viewer very unsettled until it’s time to outright disturb or shock us. So, overall the film is a slow burn but, one that keeps you interested and edgy until it’s time to crank things up. The only real flaw here is more from the fact that it is a remake so, some of the impact of what occurs is lost when it adheres to the original story. If you haven’t seen the original then this should not be an issue. For me it did lessen the effect of some of the scenes I was familiar with. But, Mickle does make up for a lot of it with a good cast and he gets good work out of his actors. We have Bill Sage who’s solid as the family father Frank who seems a little off even before we know what is going on. Ambyr Childers and Julia Garner are very effective as teen daughters Iris and Rose as they now must handle the ‘duties’ the death of their mother left in their charge. Michael Parks is very good, as always, as Doc Barrows, the man who starts to feel there is something very wrong going on in the Parker house and that something might be connected to the disappearance of his daughter. Rounding out the cast is veteran actress Kelly McGillis as neighbor Marge, Wyatt Russell as Deputy Anders and young Jack Gore as the youngest Parker, Rory. While I may still prefer Mickle’s previous two films, this is still strong work from a director who I have felt since first watching Mulberry Street, was one worth keeping an eye on. He and collaborator Nick Damici continue to make interesting movies in their own style and it’s a very back to basics style in an era of CGI and computer editing software FX. And to me I find the old school approach very refreshing. A tense, disturbing chiller from a man who continues to impress on the independent horror scene and for once a remake that improves upon it’s source material. Larry Fessenden is one of the busiest people on the indie film scene especially when it comes to indie horror. If he’s not writing and directing one of his own features, he’s acting, producing, or both, for features made by other indie filmmakers such as Ti West and Jim Mickle. Having just seen him as the backwoods father in Jug Face, I now got to see his latest directorial effort Beneath. The title in this horror flick, written by Tony Daniel and Brian D. Smith, refers to not only the giant carnivorous fish hiding in the waters of a remote mountain lake, but also the dark sides and secrets that lie hidden within the six youths who it’s chosen as it’s prey. Secrets that surface along with the vicious predator as they fight to survive. And that’s what I liked about this low budget thriller, is that it takes what could have been a typical monster on the loose scenario and uses it as a study of how relationships quickly deteriorate and a group of close friends turn on each other when faced with a fight for their lives. The story is simple. High school is over and six friends decide to go for a camping/partying trip in the woods across a large remote mountain lake. There have been legends about there being something in Black Lake, but none of them, except for moody Johnny (Daniel Zovatto seen recently in It Follows), pay them any heed. So they head out into the lake in a rowboat and despite Johnny’s warnings to stay out of the water, they go swimming. Soon they realize that the stories are true and they are attacked by a large and very vicious fish that proceeds to kill one of their number, damage the boat and one by one relive them of their oars. The teens find themselves trapped in the middle of the lake with the boat slowly sinking and the fish patiently circling it’s prey. But even more dangerous then the aquatic predator is the threat they pose to each other, as they start to turn on each other and see their compatriots no longer as friends, but as meaty distractions to lure the fish away, while they try to escape. The dark secrets and hidden emotions rise up as they try to decide who stays and who is going over the side. As the day lengthens and their situation grows more dire, they may find themselves in more danger from each other than the creature lurking just outside their boat. That’s what I liked most about this little flick, is that it really focuses on the breakdown of friendships, civility and morality when the instincts to survive kick in. 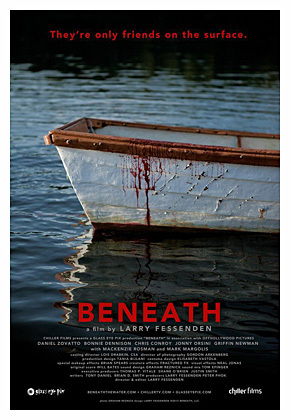 Fessenden does create a very tense situation in this sinking boat while keeping us reminded of the constant threat outside in the water. The creature is almost always present lurking nearby keeping constant pressure on the youths inside the boat. 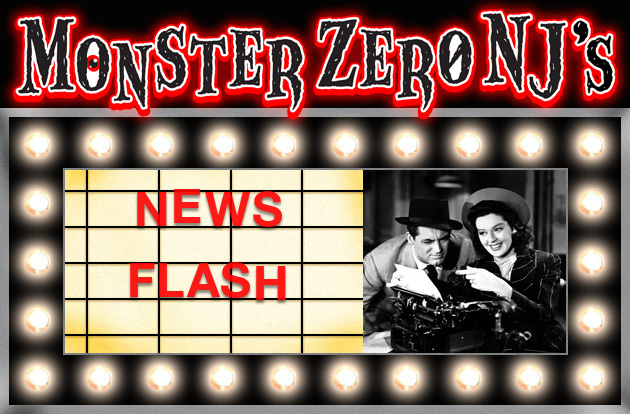 It’s this pressure that quickly breaks them down and sets them at each others throats just as quickly as the monster waiting outside the boat sets upon those unfortunate enough to find themselves in the murky lake waters. Helping the director achieve his effectiveness are fairly sturdy performances from his cast including the before mentioned Zovatto as Johnny, Bonnie Dennison as Kitty who is Johnny’s ex and is now dating jock Matt (Chris Conroy), Jonny Orsini as Matt’s brother Simon, Griffin Newman as would be filmmaker Zeke and Mackenzie Rosman as sassy Deb. Rounding out the cast is Mark Margolis as Mr. Parks, an odd neighbor who gives the teens the traditional ominous warnings. None of the cast are perfect, but considering the material’s intensity, they handle it effectively enough. As for the effects, there is plentiful and well orchestrated gore and Fessenden wisesly chooses to go with a animatronic fish over CGI and while it isn’t the most realistic looking critter ever on film, it is effective enough in appearance and movement and has far more personality and threat then something created digitally. Being that the creature is more of a catalyst for the horrors going on inside the boat, it is more then efficient for it’s purpose. The film is not perfect. There is some weak dialog that sticks out here and there. The teens turn on each other and come to the conclusion that sacrificing one of their own is a good idea far too quickly, but I can understand for the sake of keeping the story moving as to why the breakdown occurs quicker then you might expect. There are some time lapse shots to indicate that they have been there much longer then the 90 minute running time, but the events still take place over a matter of only a few hours and things do disintegrate rather rapidly, especially considering they have been long-time friends. There is also one character’s fate that I’m not sure totally worked except to move certain story elements along, but for the sake of not ruining anything, I won’t mention details. Flaws aside, this is an interesting and effective horror that has some intense and disturbing moments and some good old fashion bloodletting, too. I give it a lot of credit for taking what could have been a routine monster movie and turning into a character study of how fear and survival can break down moral barriers even among friends. So I would recommend this to those who like indie horrors and something a little offbeat and outside the box, but to be honest, even if you like your horror a bit more traditional, there is enough of the monster movie elements to make it certainly worth a look. An entertaining and offbeat little horror from a man who has made quite a mark on the indie horror scene. 3 toothy and hungry lake predators!